The July 2012 issue of Chess Life runs a story about the rise of IS-318 and their history-making story this past year. IS-318 won both the Junior High and High School championships in the same year. 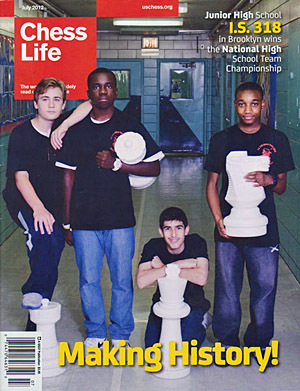 Titled, “Team of History” the article talks about how the chess culture has developed at the Brooklyn School and the structure of the program that would create champions. Run by John Galvin and WFM Elizabeth Spiegel, the school has reached unprecedented success culminated by a Magnus Carlsen’s visit and now a cover story on the national magazine! The article gives a brief profile of each player shown above: Matthew Kluska, Justus Williams, Issac Barayev and James Black, Jr. There is also an inlet on “Brooklyn Castle” a movie about some of the students at IS-318. Of course these students have long moved on, but have help to create a legacy that will never be forgotten. Great stuff. Congrats to the “young warriors” from the Jamaican Chess fraternity! These young Masters represented well at the World Open (including Josh Colas). I believe James beat IM Gabriel Battaglini (France) in round six. The French IM also lost to Justus Williams the round nine. Williams also beat IM Salvijus Bercys. Josh got two forfeit wins against GM Alejandro Ramirez and IM Michael Mulyar and was not able to get any real scalps this time.